Mangoes are healthy fruits and one must not stop eating them for the fear of gaining weight. This is the most real and healthy dessert nature has gifted us. We grow numerous varieties of mangoes in India and markets are flooded with mangoes and more mangoes all through the summer. Most rural populations have better access to good quality tree ripened mangoes than us city dwellers, but we do get our fair share of the king of fruit from all over the country. Mangoes are cleansing (detoxing) and anti inflammatory in nature, full of antioxidants, having a high ORAC score. The fruits have a wide range of carotenoids ( alpha-carotene, beta-carotene and beta-cyptoxanthin), good amount of Vit-A and C making it great for skin, mucus membranes and eyes. Vit B6 or pyridoxine is also found in good amounts that is required for GABA within the brain (It plays a role in regulating neuronal excitability throughout the nervous system. In humans, GABA is also directly responsible for the regulation of muscle tone ~ source wikipedia). No wonder according to Ayurveda, mango is a tonic food. Mangoes have good amounts of potassium, magnesium and copper (co-factor for many vital enzymes) too. Tartaric acid, malic acid and traces of citric acid make it a good alkalising food. Presence Polyphenols, pre and probiotic dietary fiber is also what makes mango a fruit fit for all. I would recommend any amount of mangoes for everyone who leads an active life, but for sedentary people and someone who wants to loos fat quickly, one can contemplate restricting the mangoes only for breakfast as a full meal or in very small amounts for other meals. In India, we love to dig into a bucket of mangoes any time of the day, many people combine with cream and sugar to make generous amounts of desserts which are further had with fried pooris etc (Ammrakhand is a classic combination with poori) so it becomes more of a caution for all those who want to loose weight or control weight. Clever pairing of mangoes can set you free to eat mangoes and stay blessed this season. I am suggesting one of those clever mango meals. 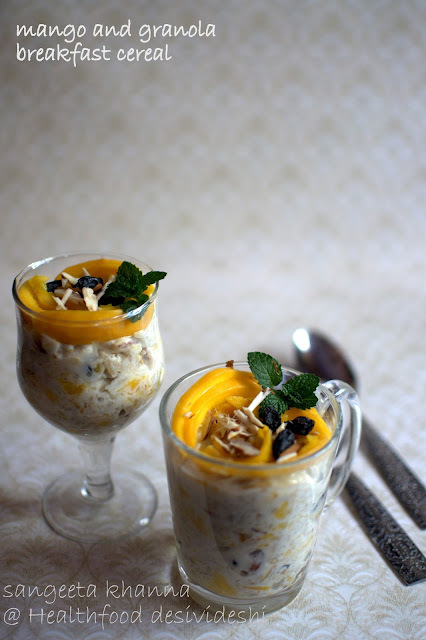 A breakfast with mango which is itself a good pre and probiotic food, combined with another probiotic cereal called poha or pohe or flattened rice flakes. The rice flakes are dry roasted in a thick base pan or roasted at low temperature in oven till they turn pinkish brown and then stored in airtight container. This roasted flattened rice is used for this breakfast cereal. Here is what all I used to make this yummy breakfast. For 2 servings, I used 3/4 cup of roasted flattened rice flakes, 2 tbsp of black raisins, 2 chopped prunes, about a dozen chopped almonds and 1.5 cup of yogurt. No added sugar is required even though the Alphonso mangoes were a little tart. 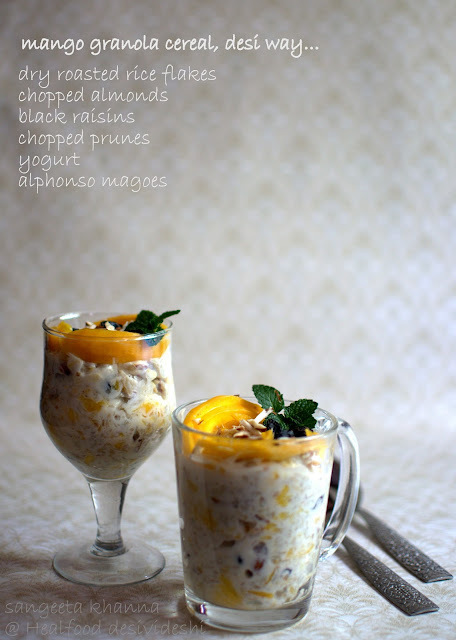 The chewy raisins lend a nice sweetness that pairs well with the tartness of mangoes and yogurt both. I used mint just for garnish but it can be used in good amounts if you like mint. Give everything a good mix and serve in cereal bowls or mugs or even in dessert glasses. Or even in coffee mugs. Eat immediately as the crunch of the roasted flattened rice flakes is not to be missed. I have seen many people in the states of Bihar and Jharkhand eating soaked pohe in the same manner, I tried that too but liked the roasted pohe version better. Mangoes are eaten in the most diverse ways wherever it is grown in abundance. In UP, people eat it with fresh cream (aam malai) and like a thick juice (aamras) as am accompaniment to meals. This cereal breakfast will be a weight watchers delight. Cooling in summers, and full of mango and yogurt health. Everything probiotic, remember I wrote about how poha is probiotic? 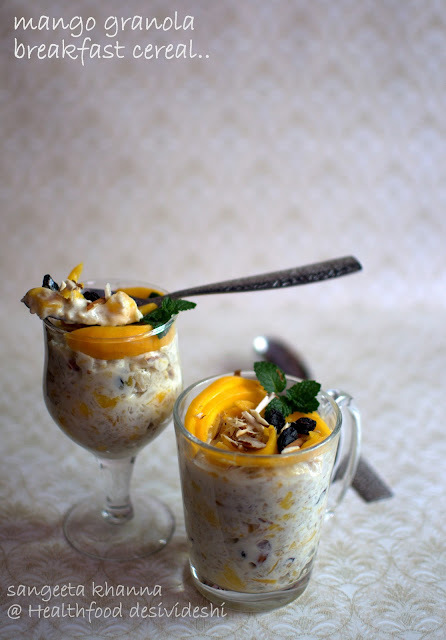 And here is another mango and poha combination in a savory version. Sweet, sour and savory in fact. I know you would love this version as well. Granola is not an Indian term but we have been eating granolas traditionally in all corners of the country. Malted ragi, poha of different varieties, lapsi and daliya, popped amaranth and many more millets are eaten like this and we need to find out more ways to eat local ingredients rather than going for imported, refined and then fortified cereals. Simpler foods are mostly whole and real, local foods are the ones you would know more about. Don't you think so? Talking of simple foods and summer, read my green summer smoothies at Ruchira's blog Cookaroo. PS : Please do let me know if you are liking my pictures now a days. Yes I have been using a DSLR for about a year now and have been improving slowly, but an online photography workshop by Neel lfp has changed the way I look at the food to photograph. Thanks to Deeba who introduced me to this workshop and to Neel who has been making me feel enthusiastic about photography lately. This looks delightful. In south Florida mangoes are very popular too. I only dislike removing the pit from the mango. The fruit is beautiful. your pics are getting better and better sangeeta. i know about the workshop. would love to see more great pics in the future. Nice recipe , Love the pics !!! Local grains, local fruits, desi breakfast, healthy, full of life - what's not to like? And supe yummy pics to urge the viewer too, the pics are super fab. Would love to check out the photography workshop for my son and me too! Ur photographs need a special mention here sangeeta, they are very sharp and perfect,keep it up. Yes, your photos are lovely. I like that you keep them simple with the focus on the food! I am totally with you on eating local, and familiar foods. Why go seeking imported food items with huge carbon footprints when we have such a rich variety of super foods here!